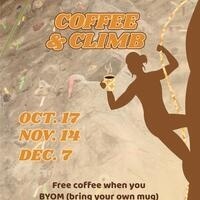 Join the ORC for Coffee & Climb on Wednesday, Nov. 14th from 7am-9am. We will have coffee and donuts available for participants! - Free coffee if you BYOM (Bring your own mug), or it will be 50 cents per cup. - Donuts will be available, while supplies last. - Free for Members. $10 for non-members.